The Telstar Sound Drone will release their debut album on Bad Afro June 3rd, 2013. The album is called Comedown and will be released as LP (first 500 copies includes a free CD of the entire album) and download. Expect feedback-ridden psychedelic rock as well as slow heavy psych. The Telstar Sound Drone formed in 2007 when Hans Beck convinced Mads Saaby to join him in a project called Les Aprés L’amour Sonnes, an artist collective working with media such as sound and video. The first project was to add sound to old educational movies, playing along with the projections. 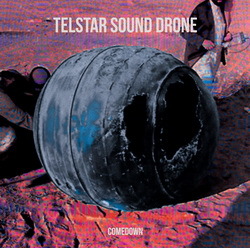 With the addition of Sean Jardenbæk the project turned into a band and settled with the name The Telstar Sound Drone. The band recorded a self-titled EP that led to a show at Roskilde Festival in 2009. After that The Telstar Sound Drone took a break while internal problems almost destroyed the band. At one point Hans Beck was the only member of the band playing all the instruments. The problems were solved and in spring 2011 they released the Mirror Pieces 7” on Bad Afro. It has taken some time for the band to finally get Comedown finished which is also due to fact that Hans Beck and Mads Saaby also play in Baby Woodrose and have been touring Europe a lot for the past couple of years. The Telstar Sound Drone line-up is: Sean Jardenbæk (Vocals, Guitar), Mads Saaby (Guitar) and Hans Beck (Drums).